The Greek city of Miletus, once “the ornament of Ionia,” was incorporated into the Roman empire’s province of Asia in 133 BC, and with the division of the empire into eastern and western halves it came under the dominion of the Byzantine (Eastern Roman) empire during the Middle Ages. By this time the city’s harbors had largely silted up and its population and commercial importance had declined. During the Byzantine period a castle was built into the remains of the city’s large Roman theater and the site came to be known as “Palatia” (“The Palaces”). As the Byzantine empire itself began to decline in the twelfth and thirteenth centuries, the Aegean coast of Anatolia was captured by the Selçuk Turks and Palatia fell successively under the control of the Turkish beylik of Menteşe in 1261 and the beylik of Aydın in 1340. As the semi-autonomous beyliks gradually became consolidated under the Ottoman empire, “Palatia” became “Balat” or “Balad,” and that is how it is known in Turkish records. A karavansaray was established at the site early in the Ottoman period—evidence of some continuing importance in trade—and just as significantly the mercantile Venetians established a church and a consulate at Balad sometime before 1355 (Greaves, 2002: 144). (1a) Silver gigliati of Palatia. There was an issue of silver coins of the Italian gigliati type with Latin inscriptions struck at Palatia/Balat in the name of the Sarukhanid Urkhan (Orhan I), ruler of the Menteşe beylik from AD 1320–1345 (AH 720–745). These are described in detail in Garo Kirkman and Celil Ender’s volume Coins of the Fourteenth Century Aegean Anatolian Begliks: 700–829AH/1300–1425AD (Istanbul, 1998), but no examples are included in this collection. Kirkman and Ender (fide Kenneth MacKenzie) attribute these coins to an illegal mint established by Venetian and Genoese merchants, but Lutz Ilisch points out (pers. comm.) 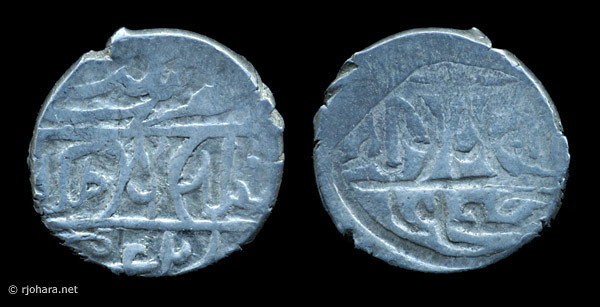 that their inscriptions (“hanc monetam fierit Vrcani | mandavit dominus Palatie”) directly attribute them to Urkhan, and that Gustave Schlumberger and Josef Karabacek, who first described these coins in the nineteenth century, showed how the European traders of the time often rented or established mints for local Anatolian princes who had no facilities to strike coins of their own. Turkish control of western Anatolia was temporarily interrupted when the Mongol warlord Timur or Tamerlane (1336–1405) swept through Asia Minor from the east and defeated the Ottoman ruler Bayezid I in 1402 near Ankara. But Timur’s hegemony over western Anatolia was short-lived, and Bayezid’s son, Mehmed Çelebi, proclaimed himself sultan Mehmed I in 1413 and attempted to recover the territory that had been lost to Timur. During his reign from AD 1413–1421 (AH 816–824) Mehmed I struck silver akçes (“little whites”) at a number of mints in Anatolia, including Balad. The issues of Balad exhibit the same general design found at almost all of Mehmet’s mints, with an obverse three-line inscription in Arabic reading “Duribe Balad | Hullide 816 mülkehü | zide umrühü,” and a three-line reverse inscription reading “Sultan bin | Sultan Mehmet bin | Bayezid.” All specimens carry the date AH 816, the year Mehmet proclaimed himself sultan, even though they may have been minted over a period of several years. Acknowledgements: For assistance in understanding the Islamic coinage of Balat/Balad I am grateful to Slobodan Srećković, author of two of the standard works on Ottoman numismatics: Akches, I: Osman Gazi–Murad II, 699–848 AH (Belgrade, 1999), and Ottoman Mints and Coins (Belgrade, 2002). These silver akçes of Mehmed I are probably the last coins ever minted at the site that had once been Miletus, a birthplace of coinage two thousand years before. This is the only denomination issued by the Balad mint under Mehmed I. The specimen shown here happens to be a brockage: a coin struck with a normal obverse but a mistaken reverse that results when the previous coin under the hammer sticks to the reverse die and so acts itself as a temporary reverse die for the next coin. A brockage is thus “two headed,” with one side being a normal obverse and the other being an incuse mirror-image obverse. RJO 83. Silver akçe (akche, aqche) (1.15 g), AD 1413 (AH 816). Obverse: Duribe Balad | Hullide 816 mülkehü | zide umrühü (in Arabic). Reverse: incuse mirror image of the obverse type (a brockage).